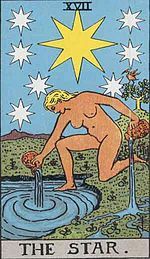 The 17th card of the Major Arcana is The Star, which shows a beautiful naked girl under the stars pouring refreshing water on the parched earth with one pitcher and reviving the stagnant water of a pond with another. She represents the glories of the earthly life, but also material enslavement to it. The stars above her are an eternal reminder of the presence of the spiritual world. 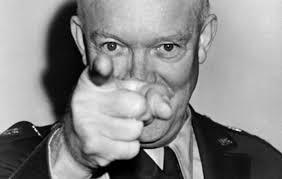 On this day in 1961, Eisenhower ended his term with a televised farewell address to the American people. It was unrepresented for a president to speak to the people on his last day in office. This fact alone should be enough for any American citizen to take note of the warning Eisenhower left us as his final act as president. He urged his successor (John F Kennedy) to be wary of the rising military-industrial complex. The War Machine. Some would say the very War Machine that assassinated Kennedy for opposing the Vietnam War. Many have heard of this conspiracy and of course Eisenhower's prophetic warning, for it is played on all the alternative/conspiracy arguments against the war machine/Illuminati or whatever we call them. There is, however, more to his warning than just opposing the war-for-profit machine. His other warning was to each of us as consumers and abusers of the planet. A very Pagan, Gaia, Mother Earth message: Ike asked us to restrain our consumer habits, particularly with regard to the environment. "As we peer into society’s future," he said, "we–you and I, and our government–must avoid the impulse to live only for today, plundering, for our own ease and convenience, the precious resources of tomorrow. We cannot mortgage the material assets of our grandchildren without asking the loss also of their political and spiritual heritage"
In 1966 on this day, a United States Air Force bomber collides with a jet tanker over Spain's Mediterranean coast, dropping three 70-kiloton hydrogen bombs near the town of Palomares and one in the sea. 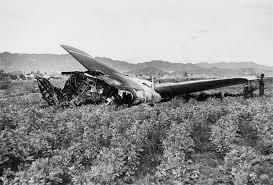 The bombs were not armed, but radioactive plutonium was scattered over the fields of Palomares, requiring decontamination. That was the official word, truth is that it was the worst radiation contamination accident not involving a nuclear power station. Three of the weapons struck land from the aircraft as it was sent earthbound. Three of the weapons struck land near the village, while the fourth plunged into the Mediterranean and settled on the seabed at a depth of 2,500 feet (760 meters). The detonation devices in two of the bombs that made landfall exploded on impact with the ground. 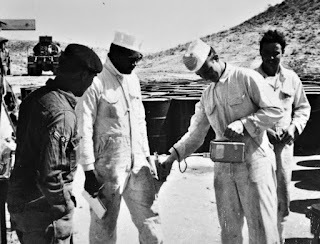 They were powered by conventional explosives, but the explosions caused considerable radioactive contamination of the area. In 2006 the Spanish and US governments agreed to fund a new clean-up operation of the area. A study had shown that the soil radiation levels were still unnaturally high. Two heavyweight boxing champions were born on this day. In 1942, Cassius Clay, Jr., was born in Louisville, Kentucky. Winner of the 1960 Olympic gold medal in boxing, Clay changed his name to Muhammad Ali in 1964 after he converted to Islam. And two years later, Joe Frazier was born in Beaufort, South Carolina, becoming the winner of the 1964 Olympic gold medal in boxing. The two pugilists met in the same ring for the first time in 1971 in the "Fight of the Century." 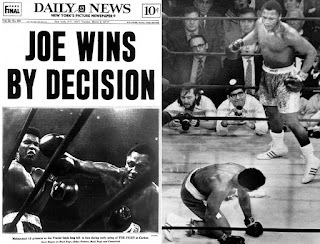 Frazier won the competition, but Ali refused to admit defeat and called the win the "White Man's Choice." Ali had also refused to go into the Vietnam War by stating the obvious: Why should I want to kill people I've never met for the white man who wants to kill me? (paraphrased)." It was talk like that that made Ali enemy number one to conservative America, and probably gave him the edge with the all-white boxing judges. We will never know. The men would fight two more times in which Ali would win using his "Roper Doper" tactics of avoiding Frazier's punches while "floating like a butterfly and stinging like a bee." Then, reaching into his pocket, he pulled out a black rubber gorilla and began pummeling it. ‘This is the way Joe Frazier looks when you hit him,’ he jibed. Ali also attached Joe Frazier as the "White Man's Choice" and an "Uncle Tom." Frazier even attached Ali out of anger in public once; at the time some thought it was staged for publicity. Later in life Frazier would admit that he hated Ali and the fight was real. Ali eventually became diagnosed with Parkinson and spent most of his days in a wheelchair. 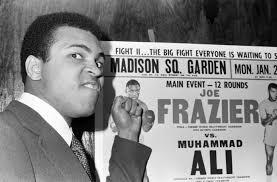 Frazier once said that he gave Ali Parkinson with his punches. A statement he later regretted saying. The fact that Frazier did make the statement shows how real the hatred had been. The two men shared the same destiny from their sun sign, but that was all.